Time. It’s the one prized commodity in life we all wish we had more of. Time to laugh and to love and to be together. Time to do things that make us happy. With everything important to you right outside your front door, Brighton Crossings is the perfect community for you to gain the luxury of time saved and time enjoyed. The expansive King Soopers Marketplace mixed with convenient stores and services create a retail hub for one-stop shopping – right down the street. Quality, respected schools are within walking distance from your new living room to the classroom. New parks, new trails, and a new rec center are mere moments away. There’s a lot of new here at Brighton Crossings, including the collections of new, attainable homes built and designed by Brookfield Residential, D.R. Horton, Dream Finders Homes, and Richmond American Homes. Everything is right here waiting for you. Go plant marigolds with the kids. Go fill the neighborhood with the aroma of sizzling steaks. Go cannonball into a pool surrounded by your neighbors and friends. Go enjoy a chocolate ice cream waffle cone. With two scoops. And sprinkles. This is your invitation to discover the greater moments of life. The moments where you make memories that last a lifetime. Go explore all that Brighton Crossings has created just for you. Your new home in Brighton Crossings comes with new parks, new trails, new rec center and much, much more. And that means a lot in Colorado’s new communities where amenities and down-the-street retail are as important as the home you choose. In Brighton Crossings, you have a multitude of things to do right outside your door. Explore our community map to learn more about the amenities that come standard with your new home. Stay informed as we share the latest and greatest of what else is “new” at Brighton Crossings. There are 8+ parks that live in Brighton Crossings. You’ll find playgrounds, open grass lawns, splash pads and more. The miles of interconnected walkways take you from park to park, from home to our shopping center, and from anywhere to where you want to go. Just down the street from wherever you live is a King Soopers Marketplace, pizza, hair and nail salons, bank and other retailers for your one-stop-shop, get-‘em-done errands. For Brighton Crossings residents only, this 3,200-square foot state of the art facility is stocked with new exercise equipment, flex space, amazing western views, and a kids area. It is a gathering place for a multitude of scheduled community events and programs. Bring your furry family members, big and small, to come play with their neighbors inside our 2.5-acre dog park. It’s a fun time for everyone. What’s better than a pool down the street that’s maintained for you? An even bigger pool with an even bigger facility, that’s what. Enjoy the current community pool, open throughout the summer, while we complete plans for its next stage. Like we said, there’s a lot of “new” happening here. That includes the brand-new monuments at select cross streets, fully equipped with beacons of light that are eager to welcome you home from the airport, from the mountains, or from wherever your next adventure takes you. Brighton Crossings lives within the Brighton 27J school district, which includes elementary, middle and high schools within a 10-minute drive from your new home. Charter and other school types are also nearby, plans for a new school inside the community are underway. Brookfield Residential. From the mid $300s. D.R. Horton. From the high $300s. Dream Finders Homes. From the $400s. Richmond American Homes. From the $300s. Coming in summer 2019, Venture Center & Water Park is the place to hang-out, workout and chill out in Brighton Crossings. After your workout in the 7,500 square foot Venture Center fitness and gathering facility, your kids can tire themselves out in the Venture Water Park’s splash pool, replete with water toys and shallow areas for water games and lounge chairs. Or, take your workout outside to the 6-lane adult lap pool. 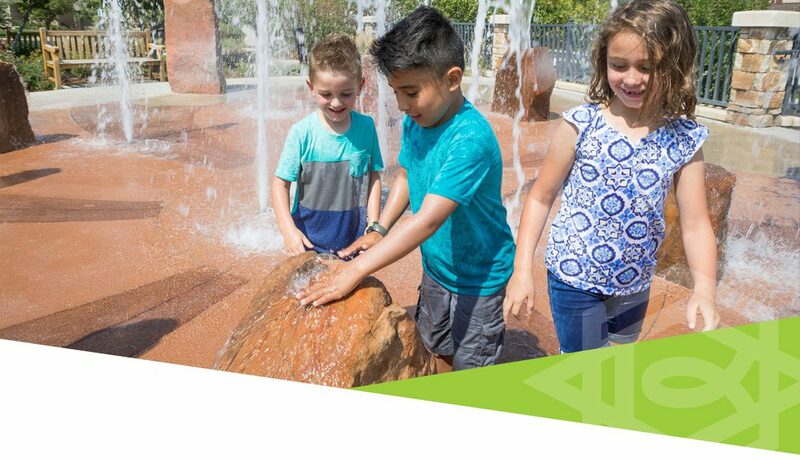 There’s even more to do in the 17-acre city park, where the Venture Center & Water Park is located. Frisbee golf, soccer and baseball fields, kids’ obstacle courses, and a perfect jogging track with exercise stations dotted throughout the park. Watch the video to see for yourself all that Brighton Crossings has created just for you. Or, Stay Informed for updates and your invitation to the Venture Center grand opening. Brighton itself offers tons of things to make you happy. Find more shopping and recreation throughout the City of Brighton, just moments away. What separates Brighton from other cities is that you feel something special here. Something different. Imagine running through a 15-acre corn maze in the shape of bears and wolves. Or make a date with Barr Lake State Park for wildlife viewing, jogging, horseback riding, fishing and mountain biking. Or even relax at a lakeside gazebo to see 300 species of birds and maybe spot a bouncing red fox, if you’re lucky. We call this being a part of a true community. You’ll call this the place you’ve been looking for all of your life. The beauty of being so close to everything is that you can use your free time to do anything you want. Visit the Brighton Armory for theatrical plays, musical concerts and fun, artsy events. Play a round of golf at the emerald fields of Riverdale Golf Course. Find fresh, juicy fruit at Berry Patch Farm. See antique trucks, cars and a century old Fire Engine at Adams County Historical Museum. Beyond Brighton, Downtown Denver is less than half an hour away and Denver International Airport is just twenty minutes down the road.